Written under General on May 22, 2011 6 People are talking. I’ve been really busy, remembering how I’m a terrible dirty hacker who hates Uru and wants to ruin it for everyone. It’s been a long time… albeit not as long as some people, who have been asking similar questions for far longer. I’m tired of this. I’ve spent 7 years watching squabbles and arguments back and forth on every possible issue, and that’s not what I’m here for. I’m here to develop, to create, to take ideas and turn them into something more. These past few years have really served to convince me that the Uru community is not the place to do that. Written under General on August 07, 2010 1 Person is talking. I… haven’t touched Blender in 2 months. I haven’t done any meaningful work in Blender is far longer. It’s sad for me to say that, because I have things that I want to do and ideas that I want to develop. We’re losing people. I’ve seen more people lose interest over the past 6 months than I have in any other period of Uru. We’ve been given hopes and promises, and now we’re all waiting for something that might never come. Times change and people get busier, and I feel that need to seriously ask myself why I’m still here. it’s not for the potential: time killed whatever potential was left in Uru. It’s not even for Plasma anymore, the more I see of it, the more I realise how much it could be improved and yet there’s no way to do that. I thought things would be more open when MOULa started, but instead they’re more closed than before. 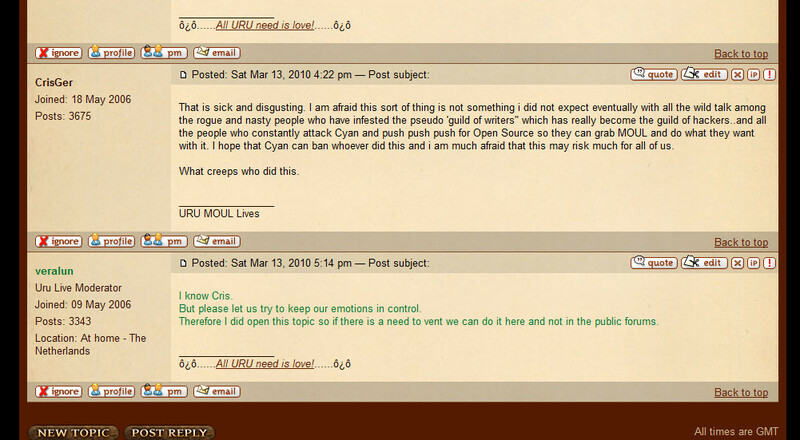 Any incentive to work on stuff is crushed by Cyan’s continued silence, and the overwhelmingly vocal disapproval of many community members. We all have bad days where we ask “Why do I put up with this?”; but when you’re seriously asking yourself that question every time you think of Uru, maybe it’s time to move on. I don’t want to be part of this anymore. Uru’s dead, more dead now than before MOULa started. I keep wanting things to change, but I can’t keep pretending that they ever will. Cyan can’t make Uru work. They’ve lost direction and fragmented so much that the only thing keeping them in business is rehashing existing games on new platforms. The “Golden era” ended with Prologue, and came to a crashing halt after Myst V. MOUL never managed to bring any of that back. The future is uncertain. I can say for sure that prpl-uruki will probably never be finished, and libHSPlasma development has mostly stopped as all the developers lost interest. PyPRP2 is up in the air, very dependent on what happens with Blender and whether there’s still enough interest to keep developing it. Without maintenance and support for the current tools, Age builders will lose interest and drift away, and with them goes any lingering hope for Uru’s potential. For now, we keep waiting… but maybe someday you have to accept that the story’s over.